Things are looking good for Jay Gatsby by the end of summer. He’s reunited with his former love, Daisy Buchanan (Mia Farrow), and – for better or worse – he’s established himself as the party king of West Egg. Sure, no one knows where his curiously vast fortune came from, but as long as he keeps the champagne flowing and hot jazz booming, no one cares either. 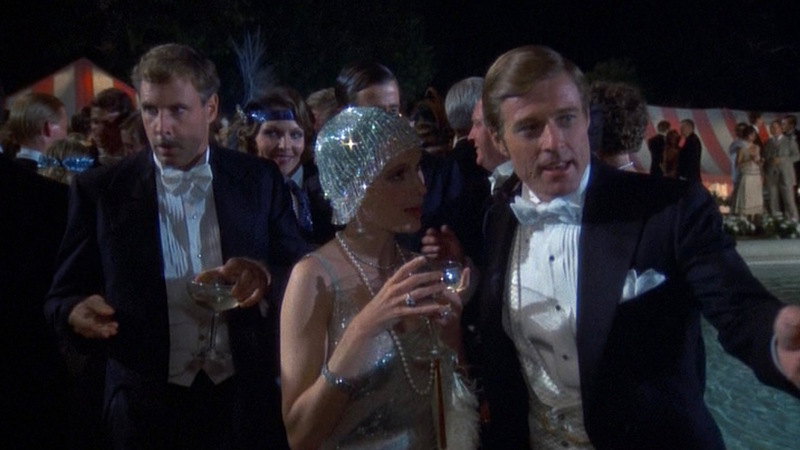 For his ultimate summer bash, Gatsby reaches across the bay to invite the Buchanans, but the adulterous cuckold Tom (Bruce Dern) is none too amused by this nouvreau riche showcase. Tom’s disapproval only fuels Gatsby as he and Daisy steal away for a few private moments during the party. Despite his one-on-one time with Daisy, Gatsby is morose the next morning when surveying the remnants of his party with neighbor and confidante Nick Carraway (Sam Waterston). Gatsby: Thank you for staying, Nick. She didn’t like it. Nick: Of course she did. Gatsby: She didn’t have a good time. Ah, but just when you think Gatsby is realizing that his dream is over, the “eternal reassurance” that Fitzgerald described in his smile returns in an instant, now directed inward to allow Gatsby to reassure himself. Gatsby: I’ll fix everything… Just the way it was before. She’ll see. Nick: You can’t repeat the past. Gatsby: Can’t repeat the past? Of course you can! 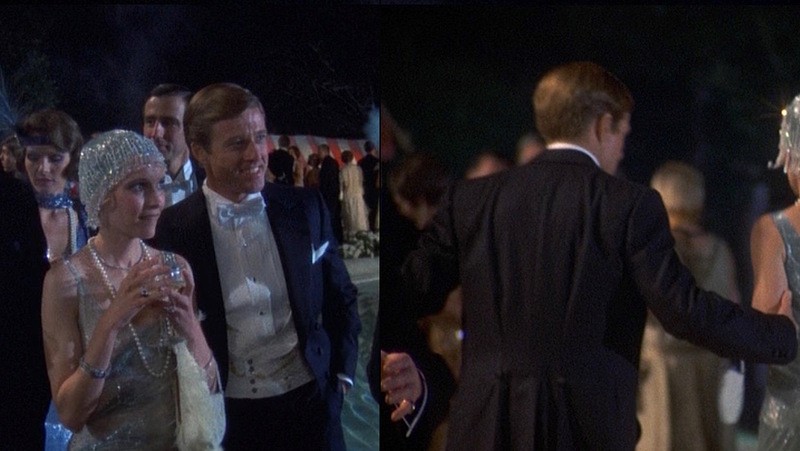 This is Gatsby’s biggest part of the season, so he pulls out the stops to look as dashing as possible to impress Daisy (and subtly intimidate Tom) by upping his usual garden parties into a white tie affair. The classic evening tailcoat – when custom made and worn correctly – is one of the most flattering garments that a man can wear, and thus the perfect choice for a 1920s gentleman looking to impress a fashionable woman of means. Gatsby’s evening tailcoat is midnight blue worsted wool with wide peak lapels faced in satin silk with no buttonhole. 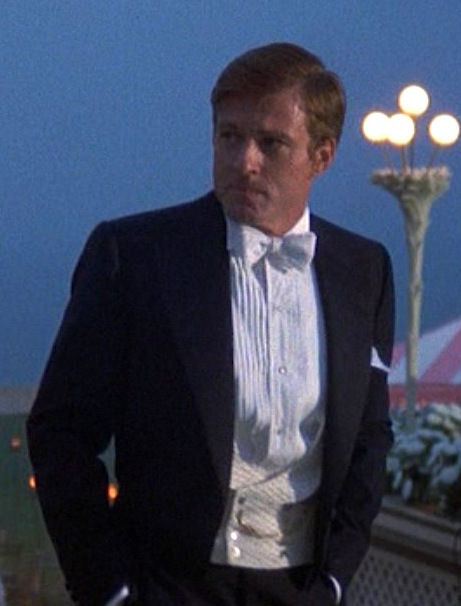 The only external pocket is a welted breast pocket where Gatsby wears a white linen display kerchief. The coat’s shoulders are wide and padded with heavily roped sleeveheads. Like a proper dress coat, the psuedo double-breasted front isn’t meant to be closed, and the six buttons on the front (three on each side of the cutaway opening) are all covered in the same midnight satin as the lapel facings, as are the two decorative buttons over the tail vents in the back and the three ornamental buttons on each cuff. The waistcoat is the one place where personalization is most welcome in a white tie ensemble, providing that it is white and low-fastening, of course. Gatsby’s double-breasted waistcoat is white piqué with a cross-check pattern that provides additional contrast against his solid white shirt. The low opening is U-shaped rather than the traditional V-shape with slim shawl revers, eight silver-toned buttons (four to close), and a straight-cut bottom. The thin gold chain of Gatsby’s pocketwatch is worn across his waist and through the second buttonhole with the watch itself in the left jetted pocket of his waistcoat. Gatsby wears forward-pleated formal trousers that appropriately match the midnight blue worsted dress coat. The trousers rise high with the waist unseen under his waistcoat, ending just above the bottom of the coat fronts and likely held up with white silk suspenders in keeping with white tie tradition. The side pockets are concealed along satin stripes which extend down the side of each leg to the plain-hemmed bottoms, although Gatsby often disregards the intent of this elegantly minimalist design by frequently placing his hands in his pockets. Ever the gentleman, Gatsby looks just as ready for a party when cleaning up his previous soiree the next morning. With its narrow pleated front, Gatsby’s white cotton formal shirt is more appropriate for black tie as white tie always calls for more formal and cleaner-looking starched bib. Gatsby’s shirt has a detachable wing collar with broad, pronounced wings. Three diamond studs are visible down the front placket above the opening of the waistcoat, although they don’t match the red oval cuff links (with silver trim) that he wears in his stiff single cuffs. This is about as ’20s as it can get, folks. Gatsby wears a butterfly-shaped white cotton piqué bow tie. Appropriately, the back band of the tie is concealed by the back collar of the dress coat. 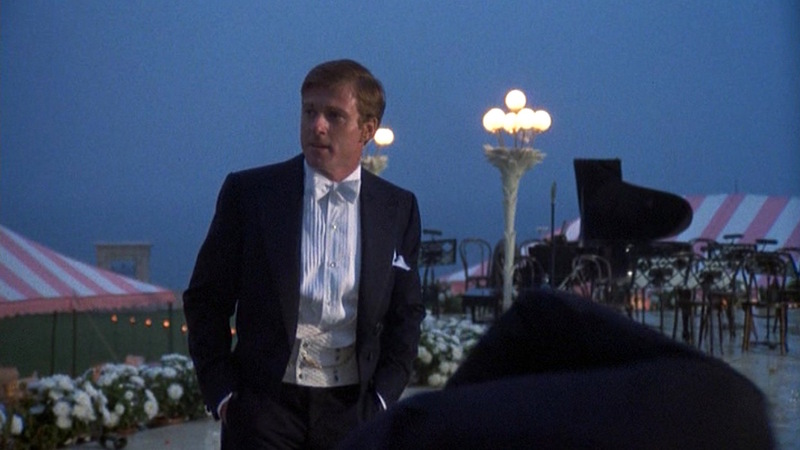 Because he’s no slouch, it’s a self-tied model that was likely custom made to perfectly fit Robert Redford’s neck. Note the subtle piqué texture of Gatsby’s white cotton bow tie. 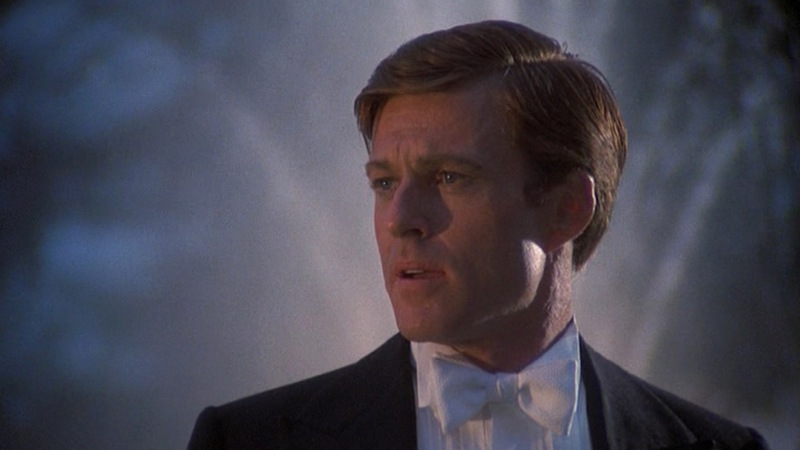 The scene mostly keeps Gatsby’s feet out of frame – the story is more advanced by his facial expressions that range from romantic joy to nostalgic sorrow – but he is almost definitely wearing black patent leather balmorals, the most formal practical footwear for white tie. Derby shoes are decidedly less formal and – pink suits aside – Gatsby isn’t enough of a dandy for court shoes or opera pumps. The glimpse we get of his black dress socks also rules out that he may be wearing dress boots. Gatsby’s cuff links, pinky ring, and even socks can be spotted best when cleaning up with Nick the next morning. Gatsby sports both of his rings during the party. 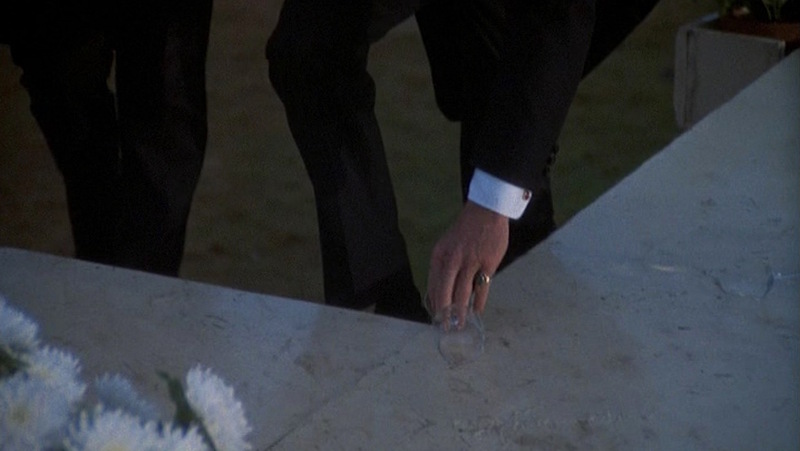 On the third finger of his right hand is the silver ring that Robert Redford had received as a gift from Hopi tribesmen in 1966 and wears in almost all of his movies; his left pinky features an ornate gold ring with a dark green stone that evokes the light at the end of Daisy’s dock. 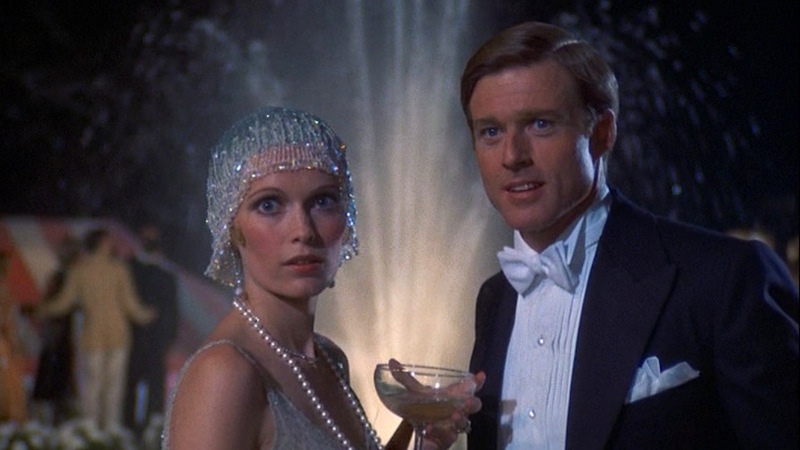 Thanks to Nelson Riddle’s orchestration, Gatsby’s parties always feature a festive soundtrack that immediately transports audiences back to a summer night during the early years of the roaring twenties. This party features “Whispering”, a 1920 ballad made famous by Paul Whiteman and his Orchestra; “Charleston”, the classic 1923 dance hit that has become synonymous with the decade; and, perhaps chosen specifically by Gatsby for Daisy, the jazz standard “It Had to Be You”. Likely the best known from that trio of songs, “It Had to Be You” was penned by Isham Jones in 1924 with lyrics by Gus Kahn. It was an immediate hit when released, and – like “Whispering” and “Charleston” – received the Paul Whiteman treatment to further popularize it. In the decades since, it has become a ballad of sweet romance in romantic comedies like Annie Hall (1977) and When Harry Met Sally… (1989). The Harry Connick Jr. version used as the theme in the latter was ranked #60 in AFI’s 100 Years…100 Songs in 2004. Gatsby’s approach to white tie is less formal than traditional sartorialists would prefer, but he is nouveau riche, so it should be expected that he would add some youthful flair to a classic ensemble. 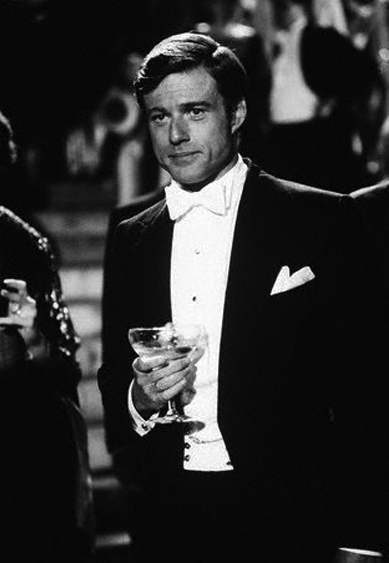 Gatsby doesn’t wear a boutonniere, instead opting for a white linen display kerchief in his breast pocket. Buy the movie and read the book – it’s one of my favorites! If you’re interested in pursuing your own formal white tie ensemble, check out what the experts at Black Tie Guide have to say on the subject. Can’t repeat the past? Of course you can! Hi, Evelyn! I felt the same way about the 2013 movie. The Great Gatsby has always been one of my favorite books, so I was initially put off by the music/style, but I came around during the party scene in Myrtle’s apartment and found myself really enjoying it…despite the soundtrack! Thanks for getting in touch.